Energy is important. It is essential to our daily lives, and is needed and used from the day we are born until the day we die. But with this urgent need for energy, there is also an urgent need to conserve it. Yet, Conserving energy is a lot harder then some people may believe. It has been said that reaching 100% efficiency without wasting any energy is almost “as possible as unscrambling an egg.” While some people believe the keys to conserving energy are turning off the lights, carpooling, and opening windows instead of turning in the AC, those actions make a small difference in the large four economic sectors of energy use in the U.S. The four economic sectors of energy use are residential, commercial, transportation, and industrial. Different forms of energy power each of these sectors, such as solar, nuclear, hydro, wind, geothermal, natural gas, coal, biomass, and oil (See Figure 1.). The residential and commercial sectors are similar in the ways they use energy. Energy is needed to keep rooms at comfortable temperatures, power appliances, heat water (bathing), provide lighting, and many other technologies. For the residential sector, heating accounts for the most energy use, and in the commercial sector lighting and heating are the main uses of energy. 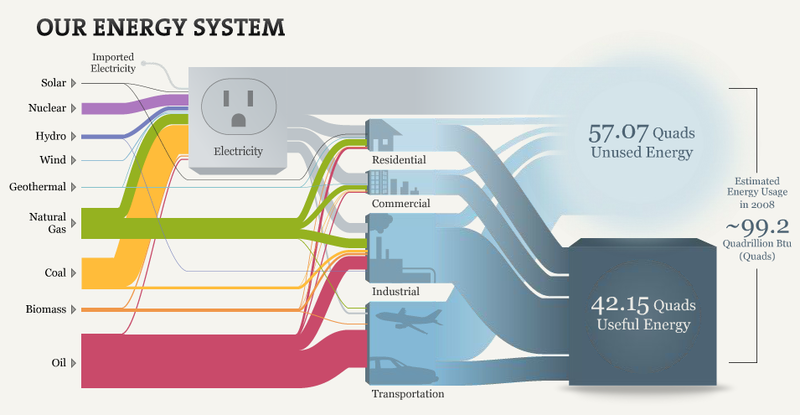 In 2008, the residential and commercial sector used 41% of the total amount of energy consumed in the U.S. Figure 1. This image represents the energy use in the United States in 2008. It depicts what sectors (Residential, commercial, transportation, and industry) use what sources of energy, along with how much each sector efficiently uses the energy they are provided with, and how much energy the sectors waste. The transportation sector includes all modes of transportation, from cars to airplanes to barges. In 2008, the transportation sector used 28% of the energy consumed by the U.S. While this is significantly less than what the residential and commercial sectors used combined, it is actually quite a significant amount of energy. This sector used 71% of all petroleum used in the U.S and 86% of the energy used in this sector comes from gasoline and diesel fuels, and these numbers are predicted to increase. In 2007, cars, trucks, motorcycles, and buses drove a total of 3 trillion miles in our country alone. To put that in perspective, that is equivalent to driving to the sun and back about 13,440 times, and the number of total miles is predicted to increase by 40% in the next 20 years, which will increase the need of petroleum, gasoline, and diesel fuels in this sector. Yet, all the energy that goes into the four sectors is not used efficiently. In fact, more then half of the energy consumed by the four sectors in the U.S. is unused or “wasted.” The energy use in 2008 was an example of this trend. The United States holds about 5% of the world’s population, yet consumes about 23% of the world’s energy usage. In 2008, the estimated energy usage was about 99.2 quadrillion British thermal units (btu) or quads, yet of this energy, 57.07 quads of the energy was unused and less than half, 42.15 quads, of the energy was used. While it is good to do the little things in our daily lives to conserve energy such as turning off the lights, in order for there to be a sufficient amount of energy being conserved, each sector has to not only decrease their use, but also improve on how much energy is wasted. The residential, commercial, transportation, and industrial sectors in the U.S. wastes between 55-60 quads of energy on average each year. That energy is equivalent to the amount of energy the United Kingdom uses in 7 years. The amount of energy wasted by the U.S. needs to be improved, and while it is impossible to be 100% efficient with energy, the U.S. is currently about 40% efficient, which leaves a lot of room for improvement. Kristin, this post is awesome I found it really interesting to learn about different sectors regarding energy use. One thing that really stood out to me was the amount of energy used in the transportation sector. Today with so may people driving and taking public transportation, I would have assumed that we would be expending a lot more energy than 23% as you mentioned. One thing that really hit me as well is that more then half of the energy consumed by the four sectors in the U.S. is unused or “wasted.” I have a question for you Kristin, how do you think we should go about being energy efficient in the U.S? Great post! I like how you put facts about energy into perspective because it helped me better understand the information you presented. I agree that the United States should develop new ways to use its energy more efficiently because our country should not be using 23% of the world’s energy if we only populate 5% of it. The challenge however is to effectively communicate this information with others and make sure that it reaches policymakers who can help this country use it’s energy more effectively. If you read my blog post it is about how Germany is effectively finding new energy sources and making sure the world has a more energy efficient future. Germany’s policymakers, citizens, and even companies are teaming up to make sure they become more dependent on alternative energy sources and use their energy efficiently. If the United States could have the policymakers, citizens, and companies agree that it is our responsibility to use energy more efficiently, then positive change could occur in our great country.